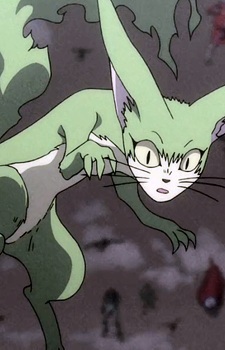 A small fox/ferret-like spirit send by the Osa of Tono to assist Ushio in his effort to purge the demons possessing Moritsuna. He becomes a good friend and loyal ally. Though he is small, Izuna is capable of fighting any but the most powerful opponents. He can fly, he has the ability to possesss both humans and yokai, he can travel through mirrors and other reflective surfaces, he's strong enough to barely lift Ushio by his shirt, and even use his flame-like tail as a blade.